*This post has been sponsored by Nielsen-Massey Flavors. No matter what it looks like outside, these Strawberry Lemonade Muffins will bring some sunshine to your day. They're light, fluffy and full of flavor. I don't know if it is because Easter is a week away, or if it is because we've been having spring weather (up til today where we've had over a foot of snow fall! ), but I have been craving lemon lately. Something about lemon just brightens your day and your taste-buds! 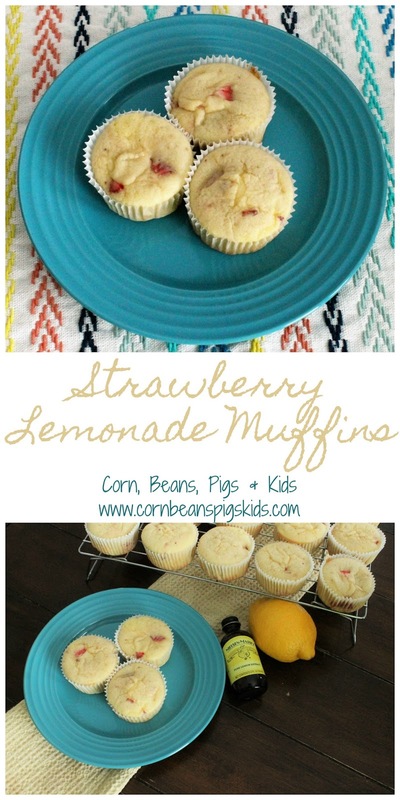 So, when I received a bottle of Nielsen-Massey's Lemon Extract I knew I wanted to make something to brighten the start of my family's day, and I decided these Strawberry Lemonade Muffins would be perfect for breakfast or brunch. 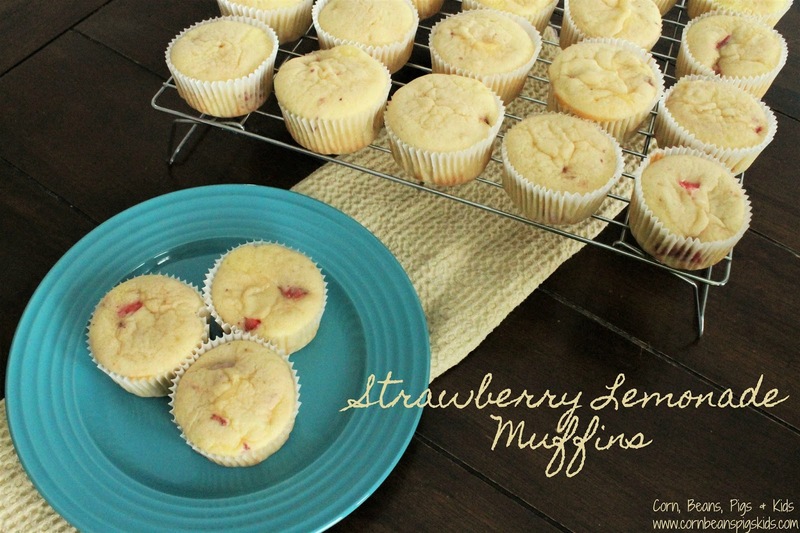 The muffins are light and fully and have everything I'm looking for from strawberry lemonade - the natural sweetness from the strawberries and the zest from the lemon. This was my first time using lemon extract and I found it very easy and convenient. This will be a great pantry staple to keep on hand in my kitchen to be able to add a splash of citrus to both sweet and savory recipes. Beat together the butter and sugar on medium speed using your stand or hand mixer until fully incorporated and fluffy. Mix in the lemon extract. Add the eggs and beat until combined. Whisk together flour, baking powder and salt. Alternating with the milk, add the dry ingredients and milk to the batter, until just incorporated. Stir in strawberries. Bake muffins at 350° F for 14 minutes. Let muffins cool in pan for a couple minutes before moving them to a wire rack to finish cooling. Makes 2 dozen muffins. So now it is your turn to make a batch! What's your favorite spring flavor? 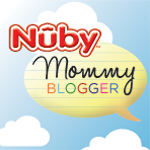 Be sure to register for my Nielsen-Massey Pure Lemon Extract giveaway and as always, Comments for a Cause! I’m with you, Lemon is great! I also love blueberry and strawberry anything too!! I love blueberry and strawberry too! Strawberries are a great spring and summer fruit! I can't wait til strawberry season to try these! I've been taking full advantage of Florida's strawberry season lately. We've been getting beautiful, delicious strawberries from Florida at our grocery store the last month. It may sound strange, but I love asparagus. Its best grilled with a touch of char! I love asparagus too. We have wild asparagus in our area so I pick our patches every few days for a few weeks each spring/summer. I don't really have a flavor that I associate with spring, unlike Thanksgiving and Christmas that have pumpkin and mint. The only thing is fresh cut grass, but I only eat that occasionally!! I will go with lemonade!! Thanks another great spring flavor! Being from Florida I do love the strawberry season. Shortly we will be enjoying California cantaloupe, which is always delicious. Give me all the lemon! Mint is a good holiday flavor. I'm a huge lemon fan as well!! Especially love lemon & almond - I have a recipe for nice, thick lemon bars that use a generous amount of almond extract in the shortbread crust. Mmmmm! I love that idea and am going to have to do that the next time I make lemon bars! Strawberries and lemon is one of my favorite flavor combinations. I can't wait to try these! Mine too! Hope you enjoy them! I am putting these on my Mother's Day brunch menu. I can't wait! I can't wait to hear how everyone liked them! 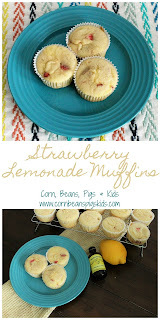 Love these...especially because they aren't make using powdered lemonade for once!!! Exactly! And the extract does a great job of giving that lemonade flavor you're looking for in the muffin.